On July 21st, the Latrobe Bulletin featured an article pertaining to Citizens Fiber’s expansion plans. Zach D’Amico stopped by the office to interview Zach Cutrell, Citizens operations manager, to get some insight on the future plans. Below is a little summary of the article. As Citizens Fiber continues with our expansion efforts, we have been focusing on creating more awareness in traditional media sources. We have been publishing radio ads on WHJB, 107.1 FM, as well as being featured in several Latrobe Bulletin articles. The most recent article discusses the reason why we decided Latrobe over Greensburg as our first expansion project. When we started the expansion process, we created an internal mapping system that tracks the interest found within each specific fiber zone. A fiber zone is a boundary that includes a certain number of houses necessary to build a cabinet. The mapping system is useful to show where the interest is most concentrated. At first, we thought that Greensburg would be our target area, with the higher population found there, however, Latrobe residents have proven to be more interested and have filled out more surveys. The interest level, or commitment level, is the most important metric we are tracking. Due to the high cost of infrastructure necessary to provide dedicated fiber line drops to each house, we have to make sure that the interest is there. The Citizens team learned this the hard way when we built out to Youngstown in 2009. As a company, we spent thousands of dollars to construct the area to only get 10 percent of customers to sign up for service. That is why we decided to take a different approach when we began our expansion plan for Latrobe. The residents check their address on our Citizens Fiber website, then from there fill out a short survey. The survey drops a pin on our internal mapping site, which I mentioned above. The zone begins as a survey zone, and then when we hit our projected commitment/interest level, the zone is then converted to a registration zone. We have recently converted four Latrobe “survey zones” into “registration zones”. Two of the zones are located on Raymond Avenue and two are on Wood Street. Once the zone hits the registration phase, the resident pays a $25 fee (credited to their account on their first bill) to ensure their interest. 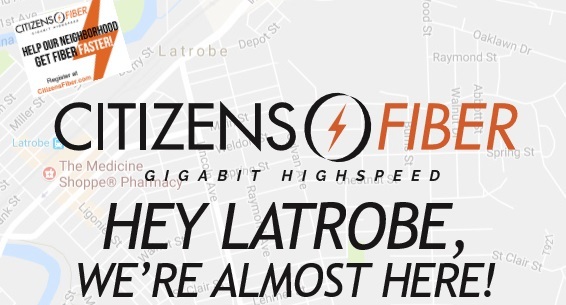 If you have any family or friends residing in the Latrobe area who are looking for a new service provider, tell them to fill out a survey on our Citizens Fiber website!